Paint selected. On to the application process. 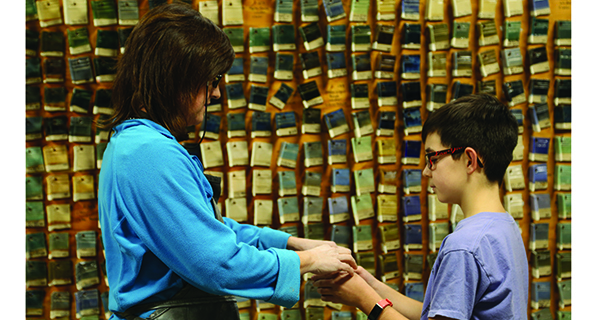 Donegan helps a student pick out the color he’ll paint his pot. Lizanne Donegan, or Mrs. Anne as her students call her, moves about the classroom as if her students aren’t children at all. With wet and fired clay moving from hand to hand, they talk openly about holiday traditions, winter break plans and school projects. Then Donegan stops and says, “No, like this. You roll it out, then drop it hard to flatten the side. Good, now take the clay-knife, cut and end like that and bend it into shape. See?” The kids follow suit, and after a few moments of quiet work, a murmured tip here and a correction there, Donegan’s students suddenly have three nearly-perfect mug handles in their hands. 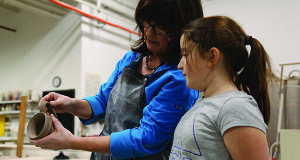 The class is taking place at Potters Place, a cooperatively owned and run pottery studio that has been running in various forms since 1980. Today, it resides in what appears to have been an old warehouse, over by the Walpole train station, with enough room to support the work of twenty-three residents and the many classes that each of them teach. Where once there was a mound of clay, now there is a perfectly formed mug. The seriousness with which Donegan treats her craft and teaching does nothing to detract from the fun of the classroom, however. “Why’d you write ‘Kids’ on my piece? Is it because mine’s so good you couldn’t tell it apart?” one of her students asks. Donegan tosses back a laugh and keeps on working.